Looking for something to use when pushing into a classroom? Grab a pack of 3” x 3” sticky notes and use this template to print your own sticky notes for writing skills! These are a great tool to bring into the classroom for inclusion or push-in sessions. Do you have a student on consultative services for language skills? Print these reminders and give them to the teacher to use with the student. You can also use these in the therapy room as a visual cue for written expression. 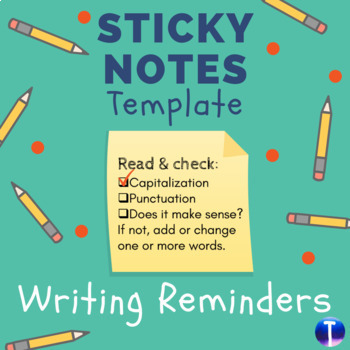 This product includes 3 different writing reminder checklists that you can print onto sticky notes. 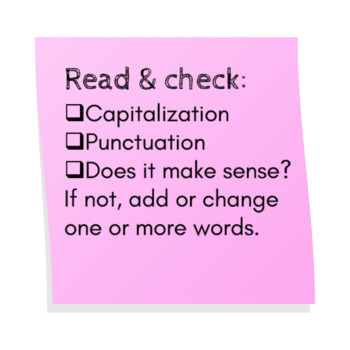 Read & check: A proofreading sticky note checklist that reminds students to check for capitalization, punctuation, and whether the sentence makes sense. 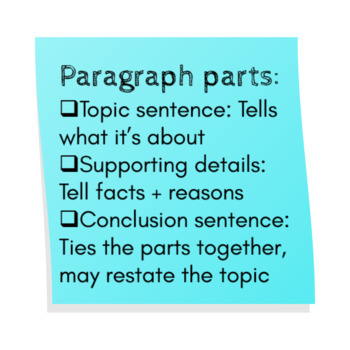 Paragraph parts: A paragraph building sticky note checklist that reminds students about the 3 main parts of a paragraph (topic sentence, supporting details, and conclusion sentence). 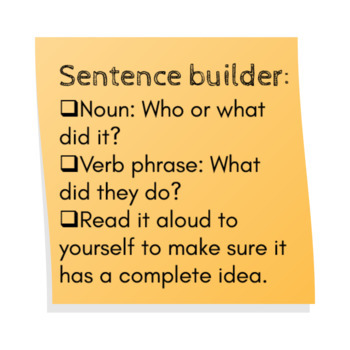 Sentence builder: A sticky note checklist that reminds students how to write a complete sentence. 1.Print the blank template page. 2.Place the blank template page into the paper tray of the printer and print one of the writing reminder pages on top of the blank template. The purpose of this step is to determine how to place the blank template into the paper tray of the printer so that the writing reminder page prints right side up, inside the squares. You will need to experiment until it prints correctly. 3.Place sticky notes on the squares on the blank template page. The sticky strip must be at the top of the square, so it goes into the printer first. 4.Place the blank template page, with sticky notes attached, into the paper tray of the printer. 5.Print the writing reminder page of your choice. It should now be printed onto the sticky notes. Follow me by clicking here or on the green star located at the top of the page, near where it says Tween Speech Therapy. I will keep followers updated as I add materials. Please feel free to ask questions. You can also read about speech therapy homework on my website, TweenSpeechTherapy.com. Amanda Dugan, MS, CCC-SLP is an ASHA certified speech-language pathologist. She works full-time as a school SLP in North Carolina. Amanda has experience serving as Lead SLP and has spent more than 10 years molding young minds. She’s provided speech therapy to all ages of children, from toddlers to teens, and especially enjoys "tweens". Amanda is the creator of the blog Tween Speech Therapy. You can subscribe to her email newsletter by clicking here.